This page offers tips, strategies, and a comprehensive list of resources for American veteran jobs. United States military veterans sometimes struggle to find a good job. The purpose of this page is to end that struggle! CareerOneStop - Veteran and Military Transition Center - Sponsored by the U.S. Department of Labor. 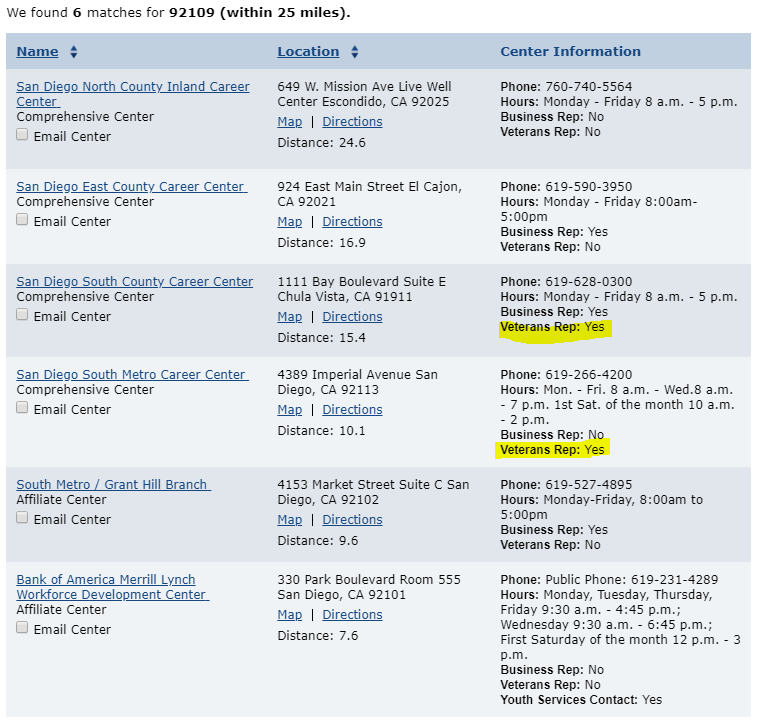 Use the search engine on the site to find an American Job Center near you. American veteran jobs can be found with the help you receive at a Center near you. Staff help veterans search for jobs, find training, and answer other employment-related questions. After searching, look at the list of American Job Centers near you and find one that has a Veteran Representative (as in the image immediately below). The Federal Employment Process - Many Federal agencies particularly value candidates who are veterans because they regard such candidates’ skill as highly transferable to the work of those agencies. Veteran Employment Program Offices (VEPO) Directory - The following is a list of Veteran Employment Program Offices responsible for promoting veterans' recruitment, employment, training and development, and retention within their respective agencies. Veterans are encouraged to contact these individuals for specific information on employment opportunities in those agencies. Veterans' Employment and Training Service (VETS) provides critical resources, expertise, and training to assist veterans in locating and obtaining meaningful careers at over. The U.S. Department of Labor has implemented Priority of Service for veterans and eligible spouses in all qualified job training programs. Learn more about resources that are offered to job seekers and program providers. Veterans' Employment and Training Service (VETS) provides resources for veterans, transitioning service members and program providers at 2,400 American Job Centers nationwide. American Job Centers help people search for jobs, find training, and answer other employment related questions. Many AJCs have Veterans Representatives who offer specialized services to veterans. Get started by entering your location below and find out how to connect with a Veterans Representative in your area. Find careers like your military job - Enter the name or code of your military classification. We'll suggest civilian careers with similar work. Careers with a Bright Outlook - New job opportunities are likely in the future. Careers on this page will grow rapidly in the next few years, or will have large numbers of openings. The Gold Card provides unemployed post-9/11 era veterans with the intensive and follow-up services they need to succeed in today's job market. The Gold Card initiative is a joint effort of the U.S. Department of Labor's (DOL) Employment and Training Administration (ETA) and the Veterans' Employment and Training Service (VETS). We can support you in all stages of your job search—from returning to work with a service-connected disability, to getting more training for new job opportunities, to starting or growing your own business. And we can connect you with Department of Labor resources for more career advice, help building your resume, and access to employers who want to hire Veterans and military spouses. Find out how you can get the help you need to build your career and find the right job or business opportunity for you. Explore support-and-services program tracks for Veterans and Servicemembers with service-connected disabilities. Our programs can help you learn new skills, find a new job, start a new business, get educational counseling, or return to your former job. If you have a service-connected disability that limits your ability to work or prevents you from working, find out if you're eligible for vocational rehab. Get step-by-step instructions on how to apply for voc rehab benefits. Find out how to get free educational and career counseling as a recently discharged Veteran or a dependent family member. See if you're eligible for educational and vocational counseling as the dependent spouse or child of a Veteran or Servicemember. JOB SEEKERS - VA for Vets is designed to help Veterans, transitioning service members and military spouses successfully find civilian careers in the Federal government. Work for VA - VA is committed to build a strong Veteran workforce. Learn how joining VA will allow you to build a meaningful career while helping your fellow Veterans. Veterans' Careers at VA - VA is committed to hiring Veterans. If you are transitioning from the military, a Veteran already, an active Reserve or National Guard member, we invite you to explore the benefits of continuing your career at VA.
Training and Resources - Need more information about the hiring process, working at VA or applying for federal employment? Check out the training and resources. Veterans at VA - At VA, we have an unwavering commitment to support our Veterans, and that includes helping them build rewarding careers within our health care system. VA gives Veterans—particularly those with disabilities—hiring preference for any available positions. Because we value the special skills and unique perspectives Veterans bring to the table. And we understand that by sharing your experiences you can continue a life of service, helping other Veterans heal and cope with being back home. Are you a Veteran interested in career opportunities with VA? If so, feel free to email the Veterans Employment Services Office (VESO) for guidance. Find other helpful employment resources, including a military skills translator, resume builder and more at www.vets.gov/employment. Education and Training Opportunities - Training and Educational Programs Offered Within the Federal Government. Lead Certificate Program - OPM's LEAD Certificate Program empowers leaders to take charge of their professional development by providing a clear path to leadership education that is relevant at five different levels, from Project Team Lead through Executive. If you are already a Federal employee, LEAD offers "must have" leadership skills and provides interagency experience that puts you squarely on the path to career advancement. If you are a veteran, LEAD helps build skills to transition from a military career to a civilian career. Put together a successful job search with resources on resumes, interviewing, networking and finding job openings. Get tips to improve job search results. Strengthen your job search by using strategies that work. Find ideas to sharpen your online image and resources to help when relocating for work. Veterans Employment Center - The eBenefits Veterans Employment Center (VEC) provides information and links to resources to help veterans find meaningful career opportunities and take advantage of special government and partner programs. LinkedIn believes every military veteran can go on to do great things. That's why we're proud to support the military and veterans community. As you launch the next stage of your career, or as your family moves from base to base, we’re offering eligible service members, veterans and military spouses one year of free access to LinkedIn Premium and LinkedIn Learning. You may receive Vocational Rehabilitation and Employment (VR&E) services to help with job training, employment accommodations, resume development, and job seeking skills coaching. Other services may be provided to assist Veterans in starting their own businesses or independent living services for those who are severely disabled and unable to work in traditional employment. Click on the "How to Apply" tab to learn more and apply for Vocational Rehabilitation and Employment services. VA's Education and Career Counseling program is a great opportunity for Veterans and Servicemembers to get personalized counseling and support to help guide their career paths, ensure the most effective use of their VA benefits, and achieve their goals.